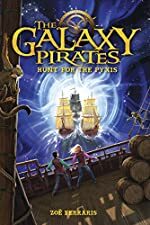 The Galaxy Pirates: Hunt for the Pyxis by Zoe Ferraris. Review: BOOM! The argh is crashing! People shout all around the massive boat. This sets the stage for The Galaxy Pirates: Hunt for Pyxis written by Zoe Ferraris, a story about two kids (Emma and Herbie) who travel to outer space to find Emma's mom and dad. They then take a boat through a portal to a sea in outer space where they begin their quest to save the planets and her parents. Along the way they encounter a ship called the Argh and the people aboard it. Some of the people on the ship with them and go them on their adventure. The way Zoe Ferraris imagines space and the planets in the book is cool and gives you a new perspective on constellations.The idea of pirates in space is really compelling and interesting. This book is recommended for ages 8 - 12 because of some bloody or graphic parts and some inappropriate words for younger readers. Galaxy Pirates is really good, and I enjoyed it. I recommend it to any kids within the ages recommended above. I am also glad that when I finished it it sounded like there is going to be another book. We would like to thank Crown Books for Young Readers for providing a copy of The Galaxy Pirates: Hunt for the Pyxis for this review. Have you read The Galaxy Pirates: Hunt for the Pyxis? How would you rate it?